Well first off Barbados is an island nation located in the Caribbean. We're actually the easternmost island in the Caribbean and are in fact completely surrounded by the Atlantic Ocean and not touched by the Caribbean Sea at all! With direct flights from Europe, North America and South America it's very easy to reach us. 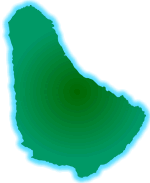 Where is Barbados relative to the other islands? We are about 62 miles (100 km) east of the Windward Islands and about 250 miles (400 km) north-east of Trinidad and Tobago. You can use the map below to see where is Barbados relative to some of the islands you might be familiar with (Puerto Rico, Jamaica, Bahamas, etc). 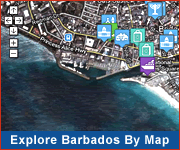 Where is Barbados in terms of time zone? 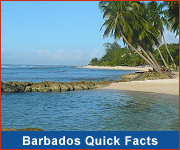 Barbados is in the Atlantic time zone; the time in Barbados is GMT -4.